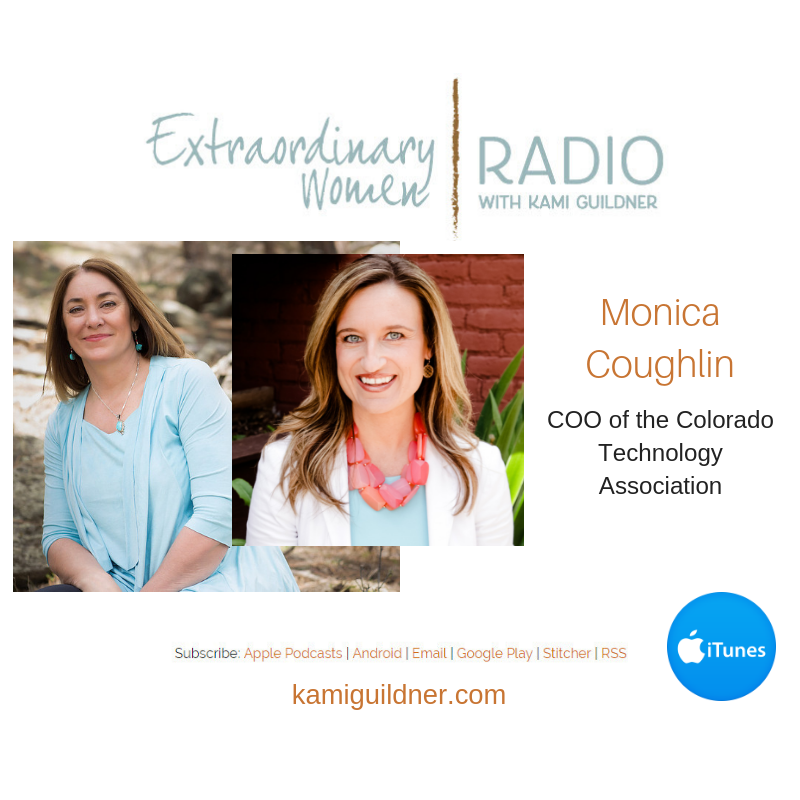 Today’s Extraordinary Women Radio guest Monica Coughlin from the Colorado Technology Association, loves how technology enables connection – makes the world a better place and allows us to connect to so many more people in the world. She is the Chief Operating Officer for Colorado Technology Association, the state’s premier non-profit tech organization advancing the Colorado technology industry. Prior to joining CTA, Monica was the Chief Strategy Officer for Colorado Office of Information Technology (OIT). In her role with the State of Colorado, Monica’s responsibilities included development and execution of OIT’s overall organizational strategy ensuring alignment with the Governor’s Office and agencies’ goals. She also focused on attracting, growing and retaining IT jobs and businesses in Colorado and supporting the Secretary of Technology in promoting Colorado as the ideal location for technology based companies and workers. In addition, her efforts also focused on defining the overall broadband strategy for the State of Colorado and promoting coordination and collaboration activities across the state. Monica has over fifteen years experience in the IT industry with proven strategy development, business operations and program/project management expertise. This included Chief of Staff for Oracle’s Global IT Service Operations, the organization responsible for all data centers and computing operations worldwide. In this role, Monica was responsible for driving strategic goal alignment, organizational readiness, employee enablement and communications throughout the organization of 600+ employees. She also worked several years at Sun Microsystems, Inc. holding a variety of business, people and project management roles within IT Operations and Services. Monica is a recipient of the Denver Business Journal’s 2013 Forty Under 40 awards and the StateScoop 50 Awards Golden Gov: State Executive of the Year and was also a finalist in the Colorado Technology Association’s APEX Woman in Tech of the Year award. Monica is a member of the Women’s Leadership Foundation Board of Directors and is the Chair of the Regis University College of Computer & Information Sciences Executive Advisory Board. You can follow Monica on Twitter or LinkedIn and learn more about the Colorado Technology Association on their web site or on Facebook or Twitter. Let’s meet Monica Coughlin of the Colorado Technology Association.